Did you finish World 1? Were you anxiously waiting for more content to learn? Well, the wait is over: World 2 is here! Are you ready to take your Chinese to the next level? World 2 is available in early access, so if you’re interested in unlocking these sweet new stages, read on! Upper-elementary content, here you come! 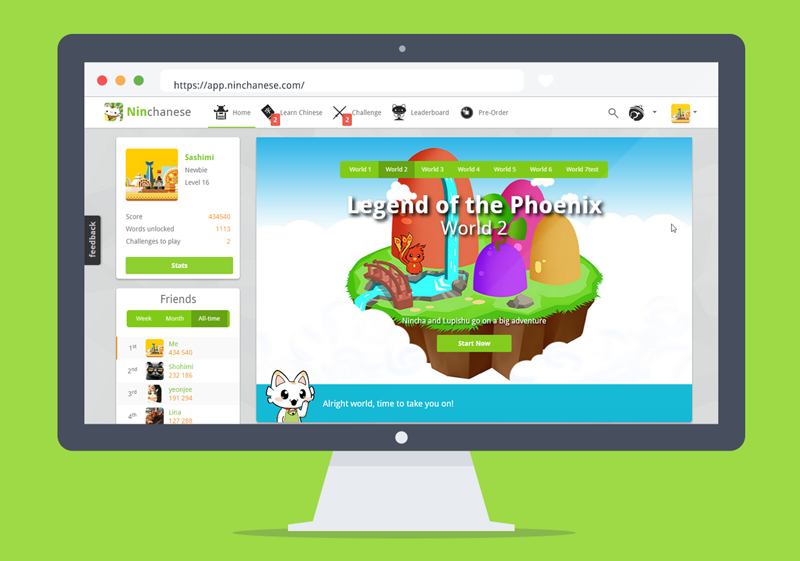 Releasing World 2 is an exciting step for us and for you Nincha learners. We’re psyched to be offering higher- level content in Mandarin Chinese on Ninchanese! In World 2, 30+ new stages are waiting for you. These new stages will take you from an elementary level in Chinese to upper-elementary. Meowsome, right? That’s over 200 more words and over 250 new sentences to learn. You’ll also be unlocking Part of 2 of Nincha and Lupishu’s story and help Lupishu grow. Meowsome! How do I get access? You can even exceptionally skip ahead to the first stage of World 2 without finishing World 1 if you can’t wait. (Or if World 2 is more your speed, level- wise). 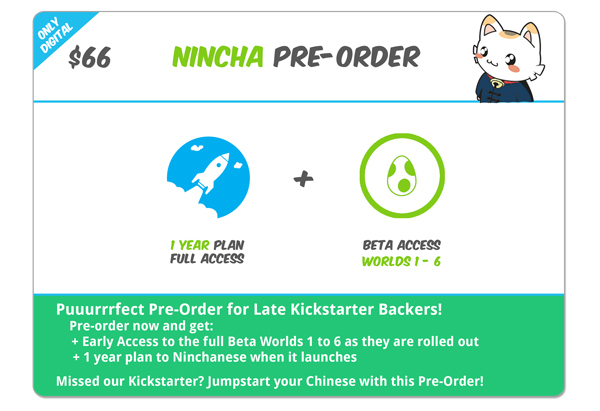 If you’re not a Kickstarter backer, you can still pre-order Ninchanese for a limited time and get early access to World 2, and the other upcoming worlds when they come out. By pre-ordering Ninchanese, you also get a one-year subscription plan when Ninchanese launches. In both cases, we’re counting on you to have fun doing World 2 and learning new things in Chinese, and to give us feedback to make World 2 purrfect when it goes public! There are six worlds in Ninchanese, and now that we’re on a roll, we’re not stopping. World 3 is coming soon, so stay tuned! With Ninchanese, come enjoy learning everything you need to speak Chinese! The web app is now in beta so sign up now to join the beta! Stay in touch with us on Facebook, Twitter, Google + and Pinterest and pre-order now!